AERNOUTSZ (Arentson, Aernoutson), JURRIAEN, Dutch sea-captain who conquered Acadia in 1674. Little is known of Aernoutsz’s career except for his brief involvement with Acadia. During the third Anglo-Dutch war he was commander of the frigate Flying Horse, based at Curaçao, in the West Indies. After the Dutch had regained New York, the Flying Horse was dispatched by the Governor of Curaçao to conduct hostilities against France and England in the North Atlantic. However, when Aernoutsz reached New York he learned that England and Holland had made peace by the Treaty of Westminster, 9 Feb. 1673–74 (o.s.) and his commission remained good only against the French. Aernoutsz’s decision to attack Acadia resulted from his meeting with John Rhoades, a New Englander who described the country to him and agreed to serve as pilot for the expedition. Aernoutsz conquered Acadia as quickly as Sedgwick had done 20 years before. On 10 Aug 1674 (n.s.) the Flying Horse reached Pentagouet on the Penobscot, held by the Governor of Acadia, Jacques de Chambly, with approximately 30 men. Aernoutsz, with 50 men (Buade de Frontenac says “110 corsaires hollandais”), took the fort by storm in two hours. Chambly, wounded in the encounter, was taken prisoner. 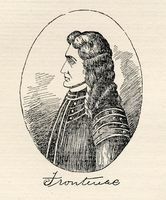 Aernoutsz destroyed Pentagouet and proceeded eastward, pillaging all the French posts along the west shore of the Bay of Fundy (Baie Française) and capturing Chambly’s lieutenant, Pierre de Joybert de Soulanges et de Marson, commander of Fort Jemseg on the Saint John River. In all, Aernoutsz spent a month in Acadia, a short time to justify his taking formal possession of the region, which he called “New Holland.” He then sailed to Boston where he disposed of his plunder, even selling the cannon from Fort Pentagouet to the Massachusetts government. Some time in October 1674 he sailed for Curaçao, but left his prisoners and a number of his company in Boston, including John Rhoades. Aernoutsz’s efforts were soon negated by the action of Massachusetts. John Rhoades and the other men Aernoutsz had left in Boston, acting under Aernoutsz’s orders to return to Acadia and maintain possession, began seizing New England vessels coming to trade with the Indians. Massachusetts apprehended Rhoades and his cohorts and tried them as pirates. Ultimately they were all released or banished from the colony, but in the meantime the French re-occupied Acadia unmolested. The Dutch government, hard pressed by Louis XIV, could only protest to Whitehall. Documents pertaining to the Dutch conquest of Acadia are widely scattered among European and American depositories, but the principal ones have been printed in Documentary history of Maine, IV–VIII, and in Charles W. Tuttle, Captain Francis Champernowne, the Dutch conquest of Acadia and other historical papers, ed. A. H. Hoyt (Boston, 1889), which also contains the best secondary account of the episode. Some additional details are furnished by L.-A. Vigneras, “Letters of an Acadian trader 1674–1676,” N. Eng. Q., XIII (1940), 98–110, and Mémoires des commissaires, I, 51; Memorials of the English and French commissaries, I, 122. For the French account of the conquest see Correspondance de Frontenac (1672–82), in APQ Rapport, 1926–27, 73. William I. Roberts, 3rd, “AERNOUTSZ, JURRIAEN,” in Dictionary of Canadian Biography, vol. 1, University of Toronto/Université Laval, 2003–, accessed April 24, 2019, http://www.biographi.ca/en/bio/aernoutsz_jurriaen_1E.html.